Medium: original etching and drypoint. 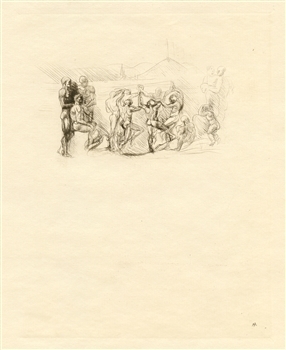 La Ronde is one of the most famous and important Rodin etchings. Catalogue reference: Delteil 5. This impression on cream laid paper was published in Paris in 1905 for "L'art et les artistes". The plate size is 8 5/8 x 6 3/4 inches (220 x 172 mm); the full sheet measures 11 3/4 x 8 1/4 inches (300 x 210 mm). Signed in the plate (at the bottom right) with the Auguste Rodin monogram signature (not hand-signed).